Whole30 challenge, day 9! I started my day with a great conversation with Gurutej, a Master Kundalini Yoga Teacher and Spiritual Leader here in Los Angeles. I have been following her on Twitter for years and I am a big fan of hers. We talked about a couple exciting initiatives that I am excited to share with you in the coming weeks. So stay tuned! I ate leftover Mustard Chicken for breakfast and it was really good. I was struggling to get some veggies in there so I had some carrots. One of the things they talk about in Whole30 is ridding your mind of the concept of “breakfast foods,” “lunch foods,” and “snack foods.” It is perfectly acceptable to eat lean protein (typically considered a lunch or dinner food) for breakfast. In fact, it’s encouraged! A lot of people think they can’t get through the day without their sugary cereal or donut for breakfast. Guess what? You can! Lunch was going to be tricky because I had a lunch planned. Thankfully there is a Spectrum Club next to my office that has a Healthy Restaurant / Cafe. They have fresh juices, smoothies, hard boiled eggs as snacks, tuna, salad, you name it. Perfect. I ended up getting their “Protein Plate” which they normally serve with toast but I asked for sauteed veggies instead. 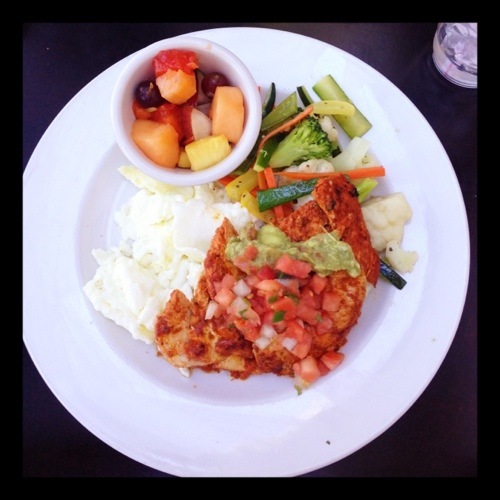 The protein plate was literally packed with protein with chicken, egg whites, sauteed veggies, guacamole, salsa, and a side of fruit. A perfectly filling Whole30 meal. It looked so delicious it didn’t seem like a diet. Well, it’s not a diet..it’s a way of life! A protein packed power lunch. My power protein plate kept me satisfied for most of the afternoon. I came home from work and decided to make tacos for dinner. And by tacos, I mean clean eating, paleo, Whole30 approved “tacos.” I didn’t have a recipe to follow so I decided to wing it. I heated up some coconut oil in a pan and added 1 lb ground beef. I reached in the cabinet and saw that I had taco seasoning from Trader Joe’s. I was going to use it, but then I looked at the ingredients and saw that the taco seasoning had organic cane sugar in it. Yes, sugar…IN TACO SEASONING. What in the heck? I was super mad and tossed the seasoning aside. Then I decided to look at the ingredients and see if I could make the seasoning myself without the sugar. I added paprika, cayenne pepper, sea salt, pepper, and red chili flakes. Then I threw in a couple splashed of coconut aminos for good measure. Wrap these up like a burrito and you’re good to go! I wanted to make sure the tacos had a good flavor so i decided to make a sauce that we could pour on the tacos. I put a little olive oil, apple cider vinegar, garlic, sea salt, cayenne pepper, and curry powder. I served in a small bowl on the side. 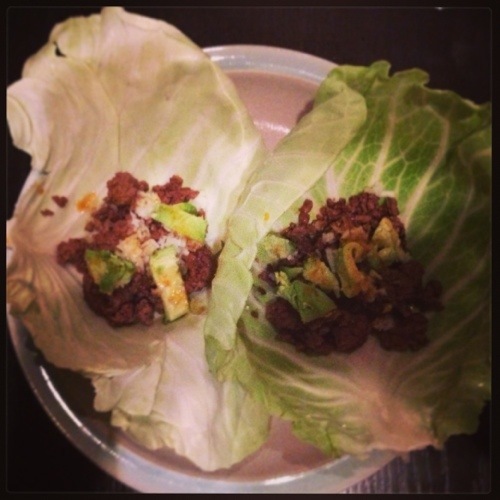 We wrapped the taco meat in big pieces of butter lettuce to serve as our “tortillas” and we topped them off with pieces of avocado and some chopped onion. They were tasty. The sauce was pretty good and I was proud of myself for cooking up such a masterpiece on the fly. It’s our new favorite dish on Whole30 next to the Coconut Chicken Curry! I noticed a change in my body yesterday. My face is starting to look thinner and it was noticeable to me when I looked in the mirror. I can also clearly see not one, not two, but five clear definitions of my ribs on my side. I’d take a picture but I think it’s be TMI. It is pretty cool to see. Must mean my body comp is starting to change. That makes me happy. Today I also learned that there is a seed butter that is Whole30 approved. It is called Sunbutter. I have never had it before but I decided it was worth trying so I got a pack of 3 on Amazon to try out. Only the organic kind is Whole30 approved though, so if you do check it out make sure you look for that. I certainly don’t need 3 packs to myself so I am planning to use one of the jars as a giveaway on the site. Subscribe to my updates and check back in the coming days to see how you can win! We also got a new addition to the house today – an herb plant! I recently have had an interest in gardening. A friend of mine handed me a perfectly shaped lemon from her tree at home a couple weeks ago and I thought to myself how nice it must be to go outside and pick your own lemons, fruits, and herbs. You know exactly where it’s coming from and it’s cheaper, too! Unfortunately we don’t have the space for a home garden (I’ll add it to the bucket list) so we settled on a potted herb plant. It has spearmint, oregano, and thyme on it. We have an area in our kitchen that gets really nice, bright light so I think it will do well. I’ve named our new plant “Herbie.” I will keep you all posted on its progress! 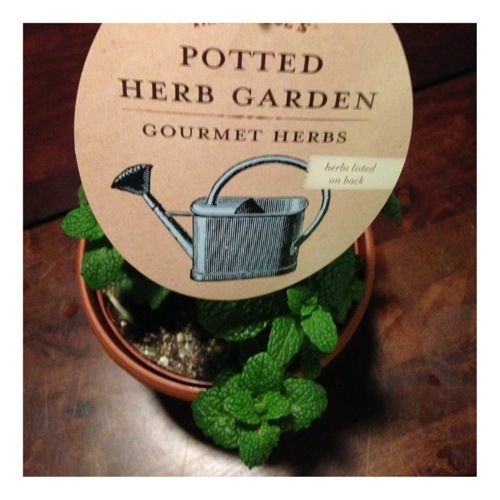 Meet Herbie, our new potted herb plant. My day ended as it normally does – a dose of Natural Calm and reading It Starts With Food. I had to get up early for an appointment so 8 hours of sleep was critical. I am putting sleep before my workouts right now. Not because it’s cold in LA, but because Whole30 says so. What about you? Do you ever notice changes in your body as you eat clean? What are your thoughts on gardening? Post in the comments and let me know! Thanks, Arika! It was soooo good. I am going to post the recipe shortly. Way to go on progress. I look forward to hearing more about the kundalini teacher–I have tried kundalini a few times and really like it. Saturday night I had a really bad stomach pain/cramp like nothing I’d ever had before. I lied down on the couch and used kundalini breathing for about 15 minutes and it went away! Congrats on all the progress you’ve made- it’s inspirational! The lettuce tacos are also a great idea and they look delicious. I’m definitely going to have to try them sometime soon. Thanks so much for the congrats. I appreciate it! It’s been a rewarding journey. I really like the lettuce tacos. It’s also great to use lettuce for paleo burgers. Enjoy! So funny…I am doing the 21 Day Sugar Detox and had mustard chicken thighs today and carrots! I want to look into the Whole30 Challenge to see what the major differences are! It’s very similar! If you can do the 21 day sugar detox you can do a whole30 easy. I start my second one this week!